From October to November 2018, I undertook a statistical analysis of the web traffic of a number of ADS archives that contain 3D data using the web analytics package Matomo. Matomo tracks web “Visitors” to the ADS websites and their “Behaviour” (how the user access and navigates through the web pages). This allows the ADS to view the number of page views for archives ranging across specific periods of time. Unfortunately, the ability to view how a user navigated through a webpage can only be seen in detail for a period of 6 months into the past. Information older than 6 months is aggregated at higher level by Motomo. An analytic particularly useful for this research are the “Entry pages” under “Behaviours” which records the page that a user entered the ADS website and where they had come from, such as a internet search engine or a direct link from another website. 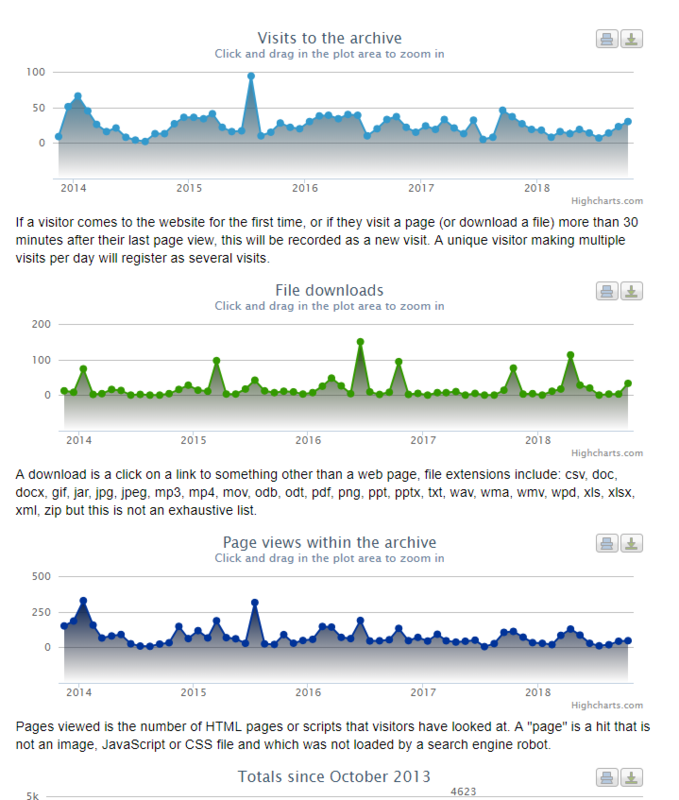 Overall analysis of the ADS web usage statistics reveals the flow of traffic to an archive over its existence is extremely varied and it is very dependent upon the archives contents. Archives relating to particularly well known archaeological sites generally receive more web visitors. This is unsurprising as more people are likely to carry out research into these sites. 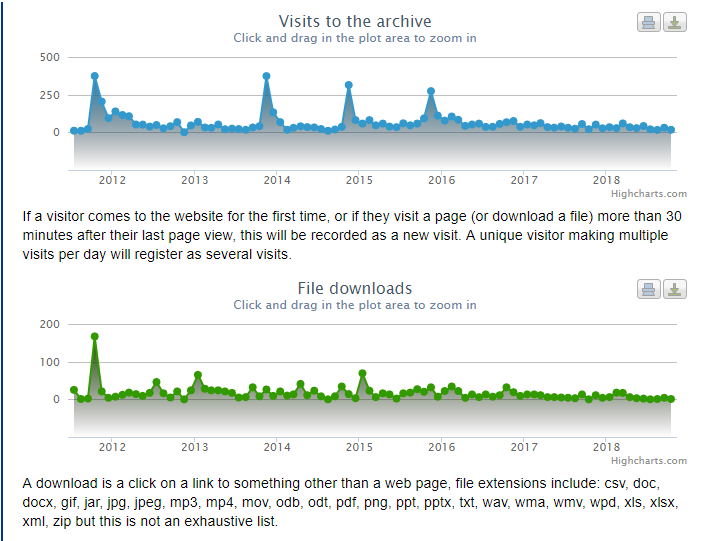 The most common pattern of usage for an ADS archive is for high levels of visitors when the archive is first released which then drops off to lower levels of visitors as the archive ages, with occasional peaks of visitors, which are often associated with the publication of a social media post, an article citing the archive, or a educational establishment using the archive for teaching. Analysis of citations suggests that traditionally the majority of ADS depositors deposit their data to be preserved without any further interaction with their data. The deposit of the data is often seen as the final part of their project marking the end of their research. This approach results in significantly lower levels of archive interaction when compared to archives where depositors can be seen actively promoting and citing their data in publications. Happily there is evidence to suggest a slow move away from this, and more active engagement with the deposition process resulting in archives being deposited prior to the publication of results allowing for the data to be correctly cited. The other key aspect of my investigation was undertook between January and February 2019. This research consisted of conducting searches to determine whether the depositor of specific archives containing 3D data referenced the ADS record in their publications or if the ADS archive had been referenced by anyone else. In order to search for publications, the main search engines used were: Google Scholar, JSTOR, ResearchGate, Academia and Google. The DOI, URL and project names were used in these searches as one or more of these three elements would expect to be referenced in a citation. An analysis of the web usage statistics and the citation tracking of five case study ADS archives which contain 3D data can be found below. 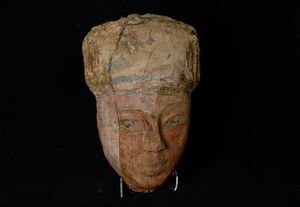 © Egypt Exploration Society, Amarna Trust. The Virtual Amarna Project archive (2011) contains 59 digital objects from the Egyptian site of Amarna, that were digitized using a laser scanner. The digital objects are part of the Virtual Amarna Museum – a web based “museum” providing public access to these objects. This archive is the first ADS archive to utilizes the 3DHOP viewer to display 3D data for users. The archive is referenced as a part of an article in Internet Archaeology regarding virtual museums in the 21st century (Limp et al., 2011). It was also referenced by Fabrizio Galeazzi in an article about the ADS 3D Viewer (Galeazzi et al., 2016 & 2016b). The Virtual Amarna Project is also linked to from the 3DHOP website, where visitors are able to see where the 3D Hop viewer has been used online. In the gallery there are examples for different showcases as well as an external users showcase, where the ADS is listed. The link leads to the ADS research page for the 3D Viewer with links to an object level 3D viewer (Amarna) and stratigraphy 3D viewer (Las Cuevas). The 3D Recording Las Cuevas Project Archive was published in 2016 and holds the digital data from the project to record the site of Las Cuevas in Belize. This site was documented using innovative 3D methods to produce 3D models. The 3DHOP viewer for this archive utilizes a special stratigraphy viewer developed by Fabrizio Galeazzi in collaboration with the Visual Computing Lab (ISTI-CNR) . The archive was published on 30 Sep 2016 with a peak of 116 unique visitors to the archive in October. The top day the project was accessed was 6 Oct 2016 with 56 views and 52 views the following day. There were a few waves over the month of popularity, however, by March 2017 the views had diminished. Since September 2016, the average amount of downloads often range at zero per month. The page views of the archive have a steady range around 20 views per month since December 2016. The Las Cuevas Project contains a specific menu link for the 3D Viewer. The 3D viewer is located on the sidebar for viewers to easily access and interact with the 3D data. It would be interesting to analyse the utilization of this link by users to reach the 3D data. 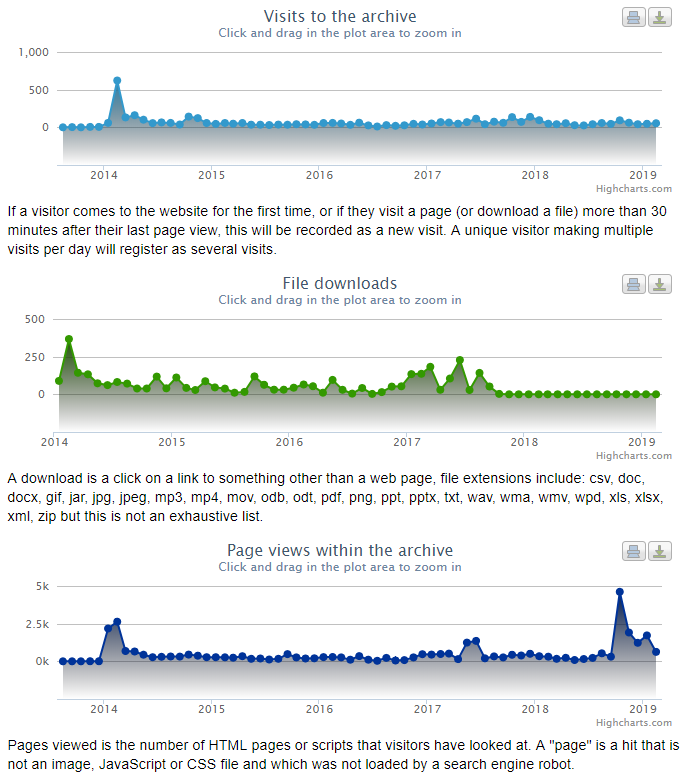 The 3D viewer has the second most views out of the archives individual pages, presently at 125 views, with the index being first with 151 views. However, as the peak of popularity with the archive occurred prior to the the last six months, the access to meaning full data on the transitions between archive pages, and how viewers found the project are not able to be viewed. Therefore, there needs to be more research going forward into finding a more recent archive with 3D data that utilizes the 3D Viewer. 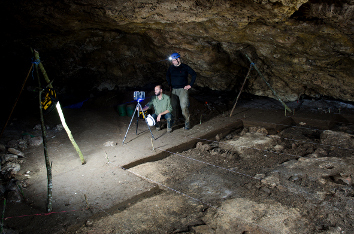 The 3D Recording Las Cuevas Project was created for publication by Fabrizio Galeazzi as part of his Marie Curie fellowship research to enhance the ADS 3D Viewer for stratigraphic visualization. The archive was cited in his article regarding web-based visualization for archaeological 3D data (Galeazzi et al., 2016 & 2016b). However, I have been unable to find additional papers referencing this archive. The website, Dimensions, also shows the usage of the DOI found within social media through Altmetric. Almetric found the DOI of the article from Galeazzi to be retweeted on Twitter 41 times from 32 different users with a various range of followers. One user was found to have over 70,000 followers leading to more exposure to the DOI. There was one public share on Facebook by the University of York, Department of Archaeology linking to the same article. These links recognize the DOI from ADS, however, it is only in reference to Galeazzi’s article which gives readers everything they need to know about the 3D viewer. This may discourage readers from going out of their way to visit the ADS website to view the archive for the project. The archive for Star Carr and Lake Flixton were publically released in April 2018 by the University of York. This well-known Mesolithic site has been revered for its excellent preservation. 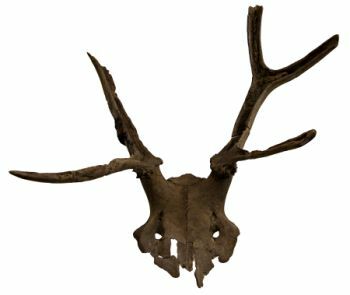 3D data for this site has been deposited for researchers and individuals to access and view in the 3DHOP viewer. The Star Carr and Lake Flixton archives had a large peak in visitors following its public release in April 2018 with 195 visitors that month and 1468 page views. The archive has since then had a steady stream of visitors ranging from 40-50 visits a month. Looking at where these viewers have arrived from, in April 2018, most came from both search engines as well as the Star Carr website. The Star Carr website has a list of links with the ‘Star Carr Archives Project’ linking to the ADS page as the first link. Between April to October 2018, there were a total of 3,071 page views. Most views originated from internal pages which was followed by direct entries and search engines. There were over 140 page views of the download page with 130 visitors going to different reports and photographs, 18 downloads and only 7 exits. One visitor began their visit to the ADS website 1 Aug 2018 while viewing the 3D Recording Las Cuevas Project’s 3D viewer over three visits. On their fourth visit the user had accessed the Star Carr Archives and began looking through the different 3D data found in the 3D viewer. This particular user was viewing this project for a few more visits until the 8th visit bringing them to search through the ADS gallery exhibit and eventually searched for “3D” bringing them to different projects. This users most recent visit included looking into depositing data and preparing datasets. By searching the DOI for the Star Carr and Lake Flixton archives on Google Scholar, it has been referenced in works from those who created the project. The citation found from JSTOR was from the book Star Carr: Studies in Technology, Subsistence and Environment produced by the depositors of the program (Milner et al., 2018). The DOI is also found in the York Research Database provided by the University of York in regard to the archives itself as well as publications that are linked in the ‘Publications’ tab in the archive. The University of Chester (2018) made a post in April 2018 when the two books about Star Carr were published. The post includes the DOI for the digital archive of the project. The Newport Medieval Ship Archive was originally published in 2013 and was updated in 2017. This archive explores an impressively preserved medieval ship discovered off the bank of River Usk in Newport, South Wales. The use of 3D technology allowed archaeologists process the structure and how it was created without fully destroying the vessel. With the launch of the Newport Medieval Ship archive in Febuary 2014 the archive peaked at 622 visitors, 2629 page views and 367 downloads. Page views jumped in October 2018 with 309 views in September to 4,615 in October. This jump in page views comes from only a few users accessing many pages. One user with the most access for the site through the month of October visited the ADS website 35 times since 18 July 2018 and spent over 23 hours on the website. On the first day of access to the archive, there were 6 users being directed from external websites with three links deriving from the same website of a Russian forum in relation to shipbuilding and drawings from internet archives. This forum is where this particular user may have found the link for the archive, however, it is unclear. Each visit the user accessed the Newport Medieval Ship. There has been numerous downloads for various documents including reports and spreadsheets, photographs and drawings. Despite downloading a lot of information, the user has not downloaded any of the provided 3D data. Another user showing numerous page views has visited the ship’s archive three times between 24 to the 25th of October 2018. The user went through different files while downloading specific CSV files and PDFs in regard to the timber found in the ship. The documented users were not directed from outside websites, but accessed the data by internal searches and direct entries; therefore, they more than likely had direct links given to them copied from another website or personally shared with the user. The project was last updated in 2017 and the depositors did not incorporate the DOI or ADS archive for their research onto any of their work. They have published papers about their 3D recording and digital modelling, however, they only linked to their main website for their project and included images, but this would be because the paper was published in 2009 while the archive was created in 2014. Additionally, there was a presentation about the Newport Medieval Ship in September 2018, in regard to the publication of Evan Jones’ book The World of the Newport Medieval Ship, with no reference or link to the ADS archive for the openly accessible data. Unlike the last few case studies, the CSA Propylaea project provides 3D data in the form of CAD models. This archive was published in December 2013 under the central aim to create a single digital resource accessible for any student or individual to use for their studies. The archive for the project was published in December 2013 with the first peak of viewers arriving then. In July 2015 the project received its largest peak with 94 visitors to the archive and 315 views within the archive. 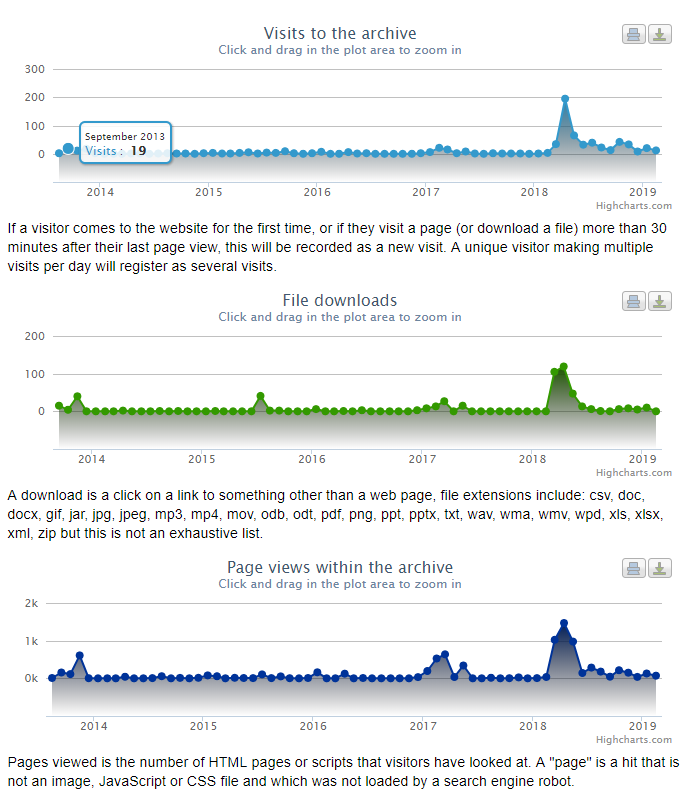 The file downloads had a lesser peak than other periods of time with 42 downloads; however, several months prior to the major peak there were 97 downloads. On average, the archive receives around 20 visits per month with 5-10 downloads. June 2016 showed the largest file download peak of 150 downloads, yet there was a drop in overall visits to the archive at the same time. It is possible one of the 10 viewers for the month downloaded a large portion of the data found in the archive. CSA Propylaea web statistics from October 2013 to November 2018. The Propylaea project’s archive is listed on their website (CSA Propylaea Project, 2013). The website includes all information and digital materials have been archived at the ADS and links the DOI. This would divert all users accessing this website to be redirected to the ADS. There is a side panel listing different aspects of the full project that have been broken up into different sections; however, each section links to the respected areas in the ADS archive. Additionally, there is one article using the DOI for this archive which was created by the ADS regarding the migration of 2 and 3D datasets (Green, Niven and Field, 2016). The primary contact, Harrison Eiteljorg II, had posted on a website about the CSA about using the ADS archive back in 2013 before the archive was published (Eiteljorg, 2013). He discusses using the ADS to hold the digital materials and remains transparent with his method behind archiving the project. While comparing the publication analysis to the statistics, there is the suggestion of a trend to ‘forget’ a project after the release of the archive by the original data creators. In the total of the 27 archives containing 3D data, only six were referenced in publications. However, there the timescale that this covered did include a long period where data citation was not the norm, and there is a suggestion that data citation is improving across the sector. The majority of the archives containing CAD 3D data had no search results outside of the ADS. Within these five archives listed, two were updated after being first published and three were mentioned by the depositor. There is also little joined up thinking in relation to physical or digital exhibits and the digital archive. For example, the project for the Newport Medieval Ship has an extensive background and exhibition in Newport. The website relating to the project has various resources provided by the members of the team; however, there has been no reference to the openly accessible content found on the ADS archive. This can be viewed in the amount of page views these specific archives encountered since being published. As the results of the research concludes, there has been little re-use of archaeological 3D data as it appears most depositors send their data to be archived and stored without any further research or interaction with the project. The deposit of the data could be done as a final part of their project; therefore, marking the end of their research. Perhaps if the depositors wrote about the data from their archive prior to sending it to the ADS, there may be information of the 3D data which would lead to being found to the ADS archive. By viewing the publication and statistics, there is an overview of individuals accessing these archives. It is not the most accurate method as individuals downloading and using these archives do not necessarily publish their work as seen in student projects. Therefore, the popularity and usefulness should not be discounted. Therefore, to I have also carried out a qualitative analysis through a user survey. My next post dives into user engagement and knowledge of the 3D data found within the ADS archives: User Survey. Galeazzi, F., Callieri, M., Dellepiane, M., Charno, M., Richards, J., Scopigno, R. (2016b). Web-based visualization for 3D data in archaeology: The ADS 3D viewer. Journal of Archaeological Science: Reports 9. ISSN 2352-409X http://dx.doi.org/10.1016/j.jasrep.2016.06.045. Green, K., Niven, K. and Field, G. (2016). Migrating 2 and 3D Datasets: Preserving AutoCAD at the Archaeology Data Service. ISPRS International Journal of Geo-Information, 5(4), p.44. Milner, N., Conneller, C., & Taylor, B. (2018). Star Carr: Studies in Technology, Subsistence and Environment. [ebook] Sheffield: York: White Rose University Press. Available at: http://www.jstor.org/stable/j.ctv9b2vq9.